There are several tourism and tourist information offices situated in the city centre, known locally as 'Oficina d'Informacio de Turisme', and these are to be found on the Placa de Catalunya, the Placa de Sant Jaume, the Passeig de Gracia and La Rambla de Sant Josep. As an alternative to hotels, attractively located apartments are available within the city. Perfect for longer stays and often conveniently located close to the Mediterranean beaches, this type of accommodation suits those happy to self-cater and many come with private balconies, boasting views of the coastline. A number of attractive Barcelona apartments and private hotels (pensiones) also reside within areas such as El Raval, l'Eixample, La Ribera and Barri Gotic, the latter of which lies close to the action around the central Ramblas area. 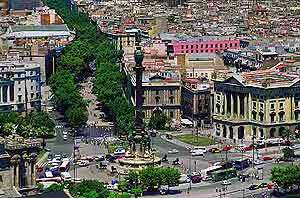 Barcelona has increased in popularity since the early 1990s, when preparations for the 1992 Olympic Games relaunched the city, with a multi-billion-dollar building boom. Many structures were restored and new impressive buildings and landmarks created, particularly around Montjuïc, the hub of the Olympic Games. When the games finished, Barcelona was left with an entirely new harbour development containing the new Olympic Village and many existing buildings had face-lifts in this economic transformation. The World Trade Fairs of 1888 and 1929 also had a strong influence on the city and resulted in much of the beautiful architecture in this alluring Catalonian capital, such as the Arc de Triomf and the spectacular Magic Fountain (Font Màgica), with colour light shining through the water. 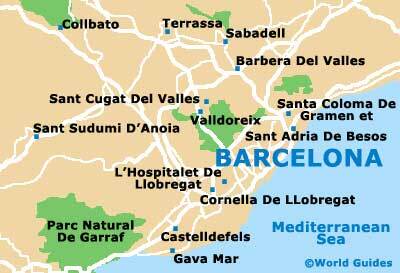 Barcelona has an enormous number of sites and tourist attractions worth visiting. Top tourist attractions in Barcelona include the Parc Güell - which features some wonderful tile work by the world-famous Antoni Gaudi, Las Ramblas - Spain's most famous street, lined with trees and used by both tourist and locals, the Parc de la Ciutadella, Barcelona's favourite parks and the perfect place for relaxing in the sun, La Sagrada Familia - Gaudi's towering church which has become a symbol of Barcelona, the Casa Mila - an unusual building created by Gaudi, and the Eixample - a 19th-century expansion of majestic avenues and mansions. There are also many important museums and art galleries in Barcelona and the most popular is the Picasso Museum, which features a large collection of paintings and ceramics created by the famous artist, together with a wealth of information about Picasso's life and achievements to date. Shopping in Barcelona is excellent and this city has arguably the best selection of shops in the whole of Spain. With everything from top designer outlets to traditional family speciality stores, there are also large shopping arcades and department stores. The markets in Barcelona are equally impressive and the food markets in particular draw large crowds of both tourists and locals. Boqueria Market is an exciting food market that is situated in a cavernous iron and glass structure and is filled with the freshest produce. Street-café life is rich and in the evenings, many people site outside in the squares and watch the world go by. Nearby excursions include Montserrat - a town close to Barcelona with many interesting features, Tarragona - with some splendid Roman remains, such as a well-preserved amphitheatre, Sitges - a popular seaside part of the city which is frequented by many families, and Barceloneta - a busy fishing area which retains its village charm and has some of the best seafood restaurants in town. 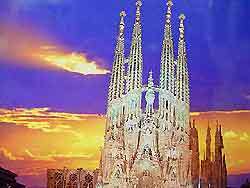 Barcelona is without doubt one of the most exiting cities to visit in the Mediterranean, and with glorious beaches and a history stretching back over 2,000 years, Barcelona deserves to be seen and enjoyed.